It is 11:30 PM on a usually loaded Monday and I am still in the shop. I went home for dinner, put the kids to sleep and told my wife I'm out to work. She's probably thinking I am out cheating on her or at least she should think so if she cared any, because that's what I think normal men do when the mid-life crisis hits. I, for one, am of the opinion that rubbing the noses on the random (let alone purposefully sent to here) readers of the product of my mental efforts and showing them how inferior they are is much more pleasurable. Even saying the above made me feel good...I wonder...perhaps that guy on eBay who said I have a God like complex maybe did have a point...just maybe...then again, how could I listen to someone who flatly rejects plain logic about how something works and what could cause it to break? All of our listings for board repair services ask that 1) boards are not tampered with; and 2) they are in good physical condition. Sure enough we receive many boards that don't meet that criteria and sure enough that's awfully inconvenient because we have do to tons of communication first telling customers they sent us something that does not meet the listed criteria, then explain them what options they have, then listen to their explanation that they've been doing repairs for many years and everything is all right, or just whining that we've tricked them into this or threats with Attorney General, Mother Teresa and what not. 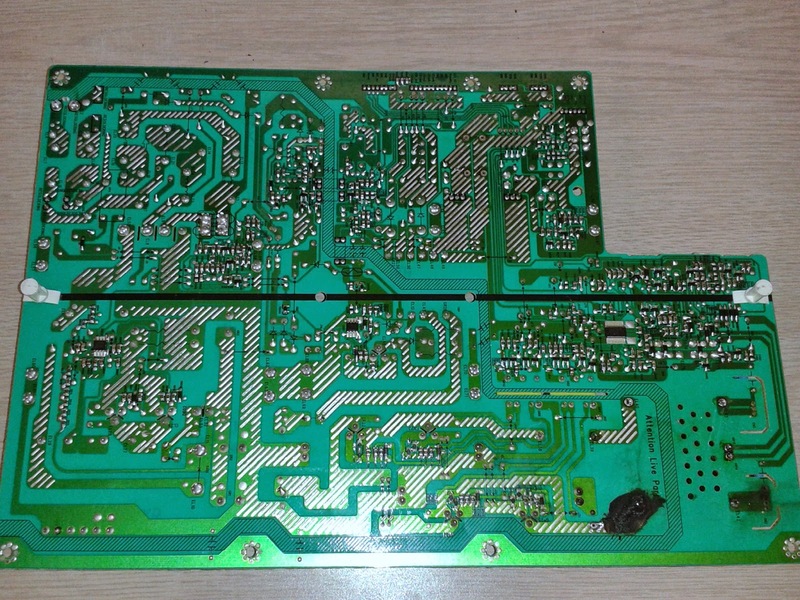 There's a rock solid logic behind those requirements and, in a nutshell, it is that the flat rate repair services we offer are based on actual experience servicing boards and a certain norm for how long, on average, it takes to repair a board. If it takes longer than that we lose money. Customers love flat prices, because they can decide upfront if what they get is worth what they'll pay. I know I don't like using any service where I have to pay just to be told what would it cost to get something serviced. Maybe. It's almost always maybe. Think any home or car service and you get the picture. You start with a simple leaking gasket and before you know it you have to replace half the car because they found it was "too old". 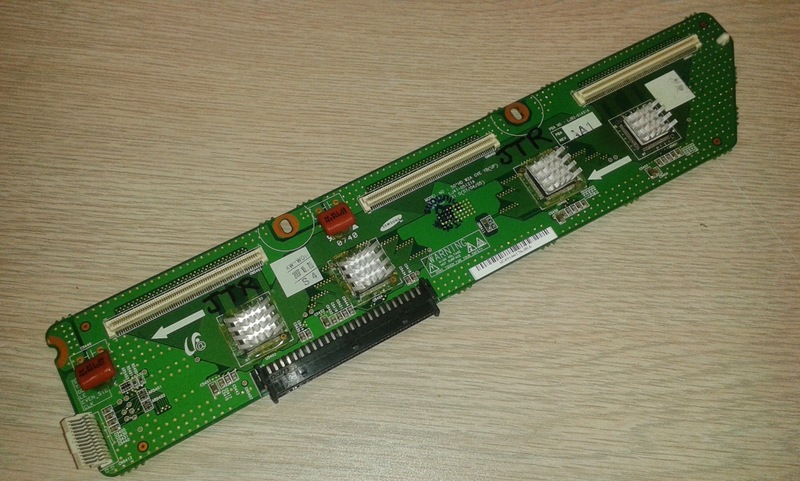 This is Samsung Y-Main board LJ92-01490A for Samsung HP-T5054 / HPT5044 / HPT5064 etc. It was sent to us by a customer after he has bought (or had it serviced) by another service provider whose initials you will find round. Nothing special can be seen on this picture. 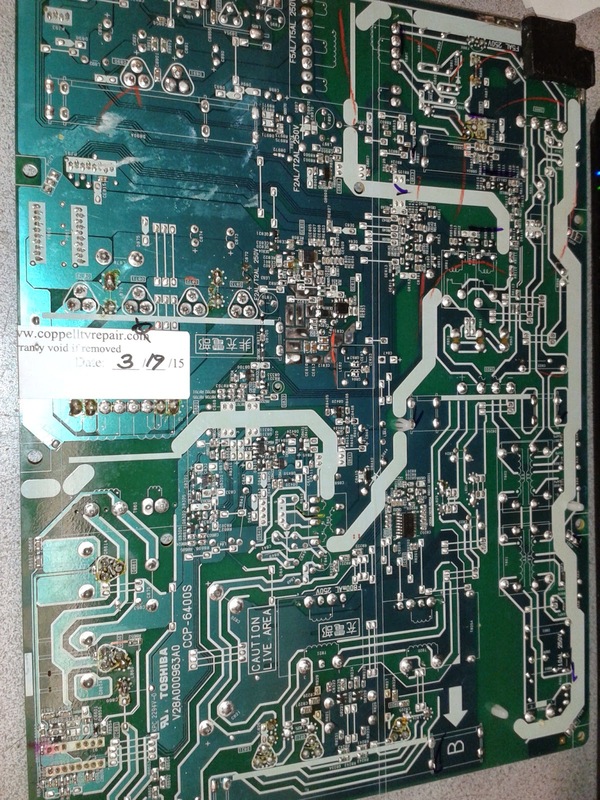 This is a view of common failing transistors on this board. The first four of the transistors on the heat sink (left to right) are 88N30W on most original boards. They are working in parallel, i.e. this is practically ONE transistor. The separation is done so that the surge in current does not overload one transistor. 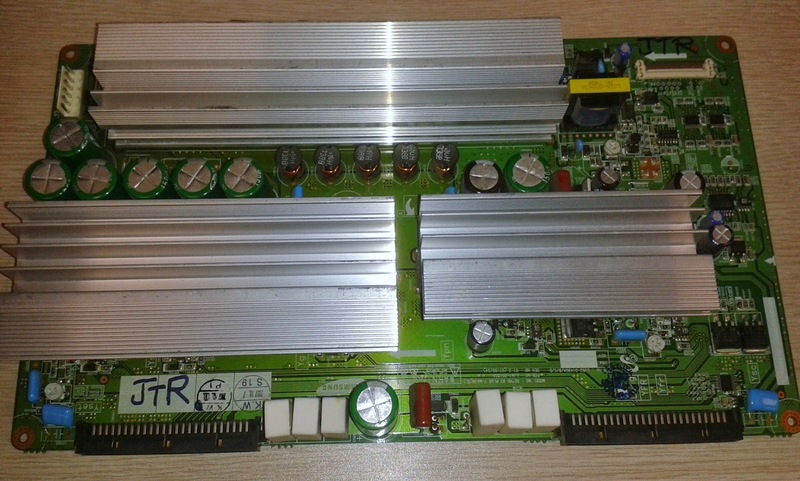 Well whoever serviced the board replaced one of those transistors with another type. Under certain circumstances this may not be fatal, but it is definitely not recommended. Well most technicians care for choosing transistors with same or better voltage and current parameters. But there's more than that and it matters a good deal. If this transistor is FASTER than the others (in technical term having much smaller Qg rating) then it would open BEFORE them and will take the surge of current. If it is much SLOWER than them then it would practically do nothing as they will take the load before it kicks in. Did you know, for example, that you can take any one of those 4 transistors out and the board would still work? Only it'll overheat and fail much faster. 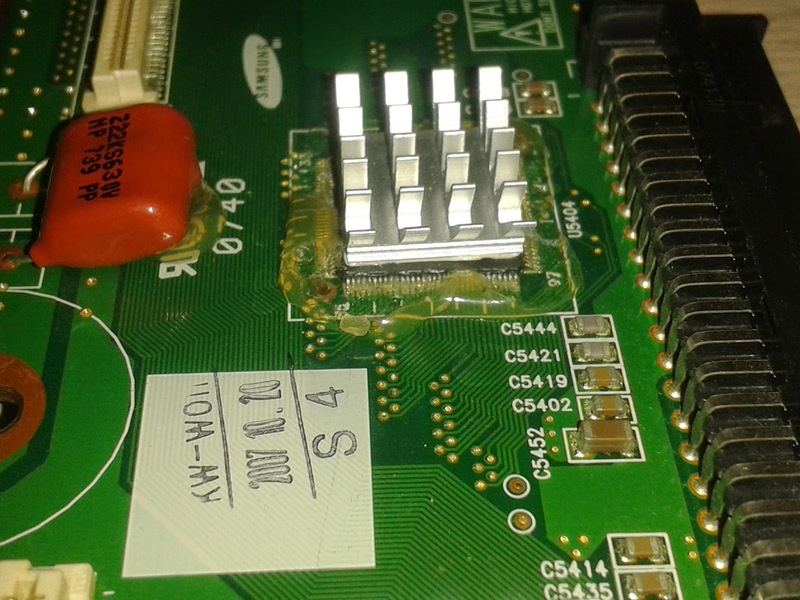 There's another something you can see if you look up closely - the transistor that is soldered on the board in front of the others is not actually laying flat - there is a gap there. It's not fatal, but it prevents better heat dissipation and that can build up over time and lead to a failure. Why is that bad for us? Well first we can't possibly see everything someone has done; sometimes we've discovered that the copper track under a solder joint is ripped out, but you could not tell that until you remove the solder and that's only if you look for it. It's easy to omit a change made by someone else and if that leads to a problem customer would naturally blame you, not whoever messed before you. And second, when we see the problems, it still takes more time to undo and do things right. 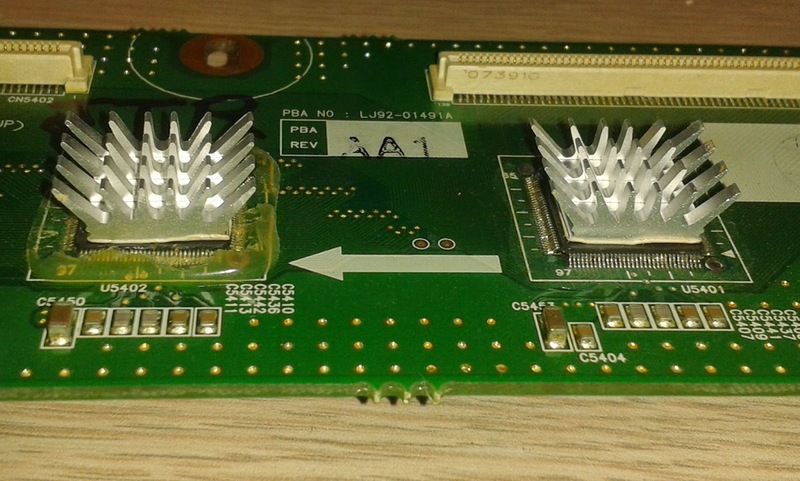 This is the back of the same board. Nothing scary at a first glance. Can you see a wire ran there between the two legs of the holder? There's a fuse in the holder (as you can see on the first picture) and then, just in case, they've run or forgotten a shortage on the back of the board! How is that bad for us? 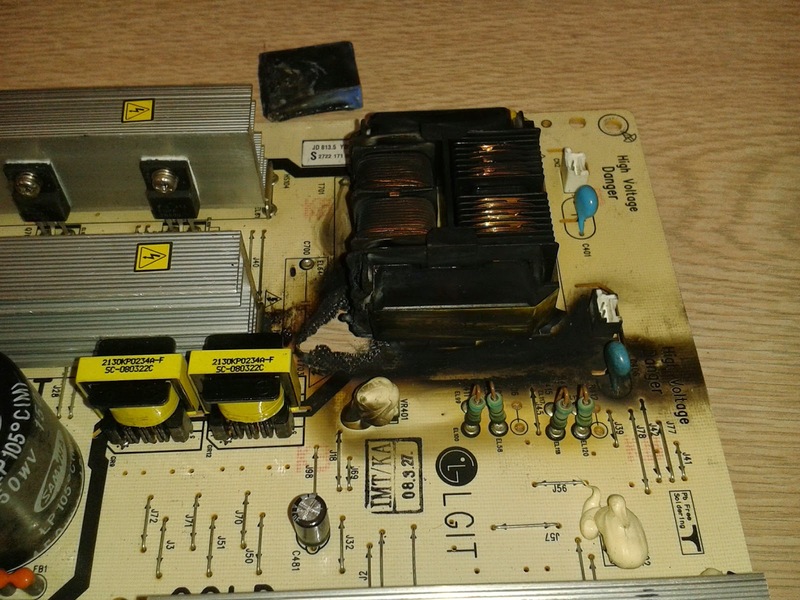 Well first if we don't see it and test the board we can make huge damage if the wire they've run is too strong and leads to toasting much before it burns. Worse, if we miss it someone may see it after us and I swear I wouldn't blame them if they think we're complete idiots (which is what we thought of those who did that). 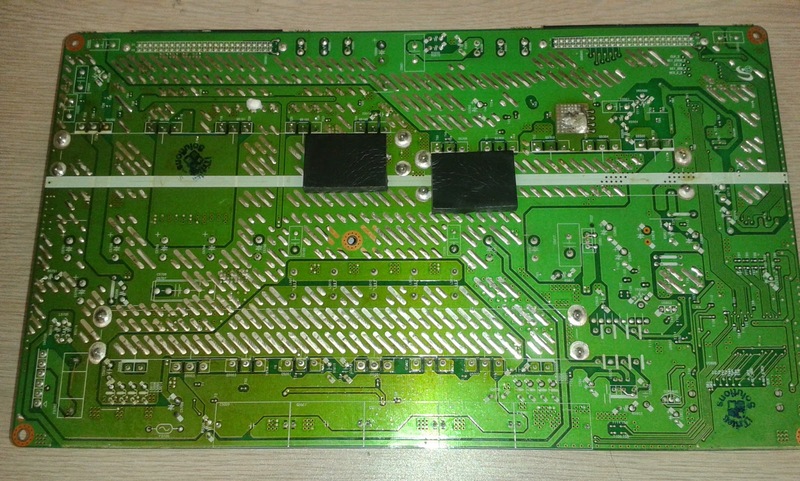 This is top buffer board LJ92-01491A that usually fails and causes the above shown sustain board to fail. This buffer came with the board from above and was serviced by the same company, which initials you can find on the stamp of the buffer. They've taken the effort to equip each IC on the buffer with individual heat sink like Samsung themselves do in many other buffers. First, as to be expected, they did not replace all ICs on the board. Only the bad ones. 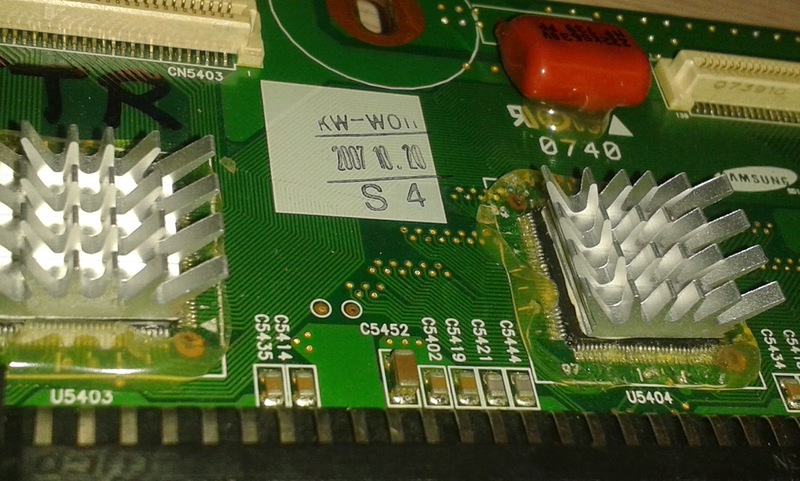 We don't replace all either - it is simply cost prohibitive - but that heat sinks business made the old working ICs kind of problematic, so they had to cut the silicone off in order to put the heat sinks on. Problem 1: They didn't seal the IC they've replaced. There's reason why manufacturers seal all those ICs! Distance between the legs is part of the millimeter and they operate at voltages that vary from -120V to +240V, which is nothing to sneeeze at. Dirt, particles and moist naturally accumulate between the legs and create perfect conditions for shortage. It is not a matter of whether, but when. A simple layer or quality silicone takes care of that! 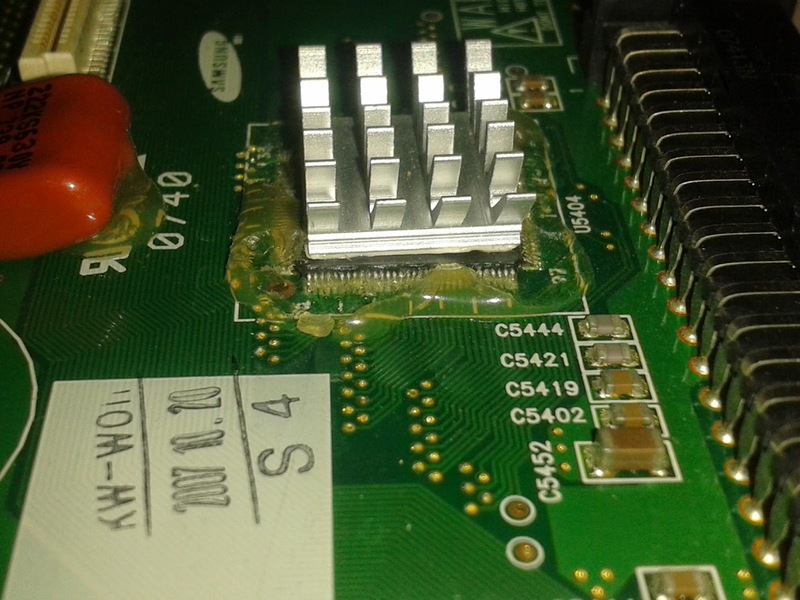 Problem 2: Not only they didn't cover the IC they replaced, they actually scratched off the cover of the remaining ICs to put the heat sinks, thus increasing the exposure and risk three times! While we could remove and replace the IC that has failed, we can't just release the board in that form. We have to explain to the customer that it's bad and, of course, they'll take it as the usual badmouthing of one tech from another and for the most part ignore it or , worse, treat it as a milking effort. We can't just seal the cuts of the other ICs either for the same reason for which a dentist can't seal a cavity without cleaning it first - there's bad stuff inside already! And while here it's not alive and once sealed is less of a problem, the act of sealing pay be just what's needed to move one particle deep enough to cause trouble! 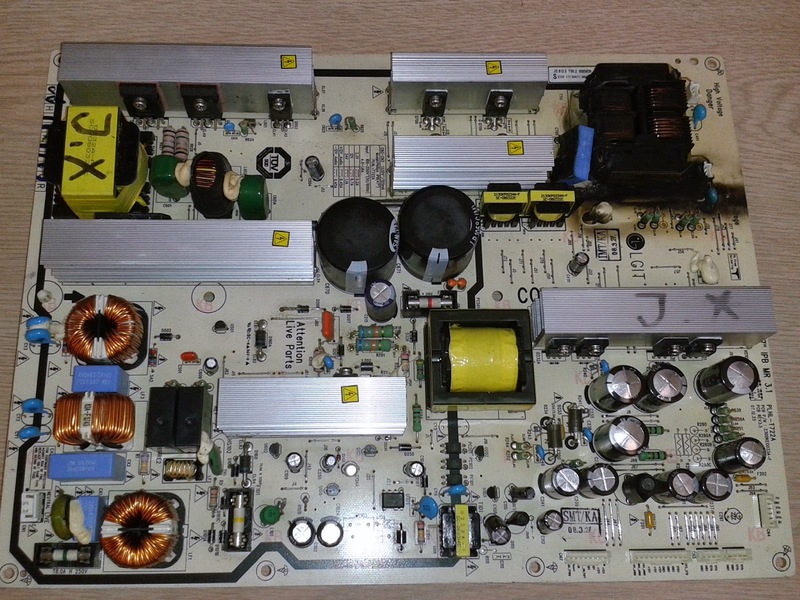 This is PE0702A power supply for Toshiba...well, sorry, don't remember the models. 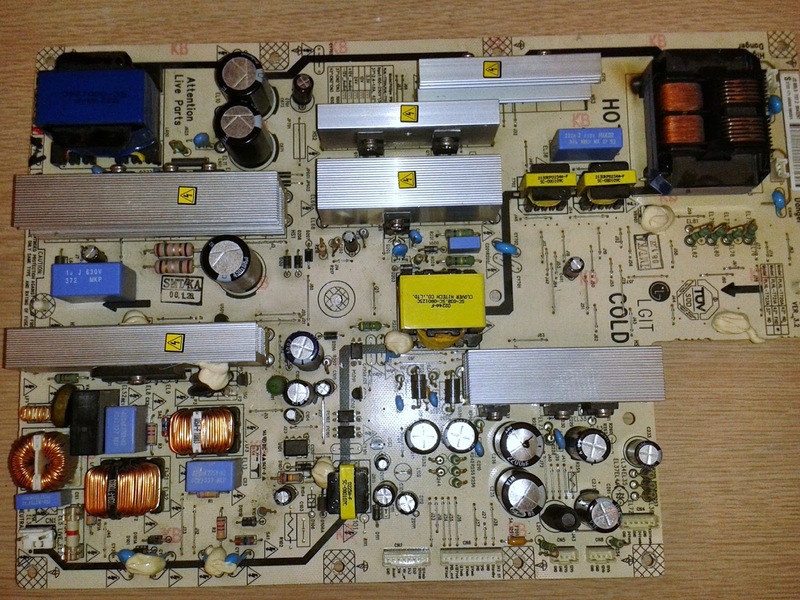 The board was returned to us by a customer after we've serviced, tested and sent it to them. The TV was blinking 3 times and never starting up. 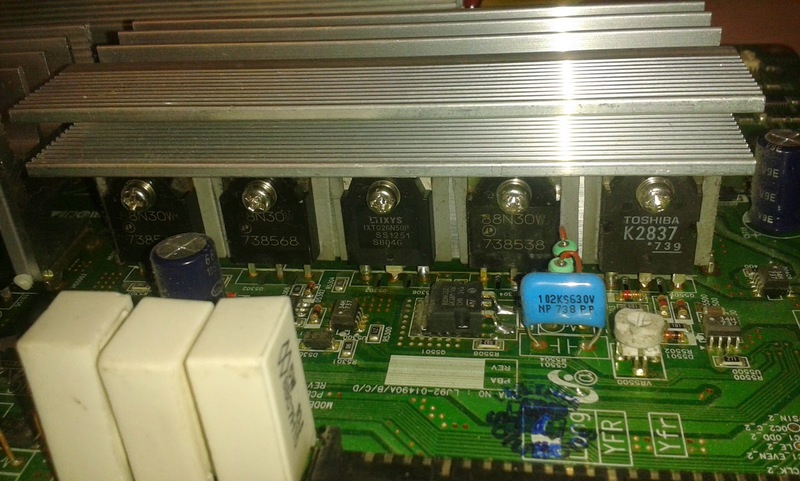 When the board came back for warranty we could confirm it was not activating its second level (24V output). It took me exactly 2 hours, during which time I did reveal the little we didn't know about the board already (we reverse engineer a lot). I narrowed it down to the circuit that drives the transformer producing the said 24V, but I just couldn't figure out why it was not working. I tested all components...even swapped the IC with one from a good working board...no change. 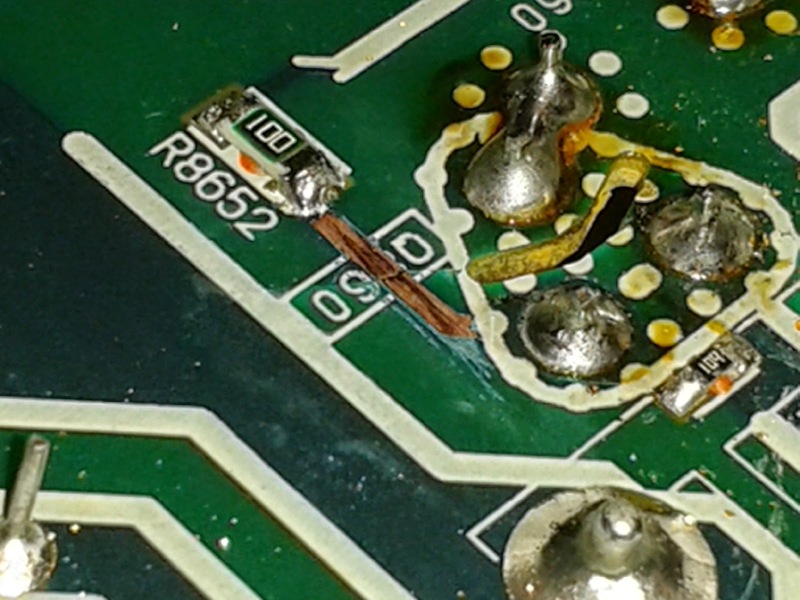 Eventually I saw two slightly bent heat sinks and went to inspect for cracked solder joints....I saw a very very light crack around a transistor and inspected it really carefully (I am near sighted and have good experience finding cracked tracks), but found nothing. I even re-soldered the FETs' legs, just in case. This is about 8mm long track, about a millimeter wide. It's painted on top. The hair line is so think I could not see it even when I already knew it was there. And I am good at seeing those! Took me 3 hours and a hopefully pissed wife and that's after the board was already repaired! Now how is that customer's fault you say and why give it as an example? When we receive a board that clearly has been damaged (i.e. cracked or torn corner) we can never know if there aren't small hairline cracks on it somewhere else. Such problems can be and often are unique and resolving them is simply NOT worth the time and effort. Unless you have a God-like complex and do it to feel great about yourself and not for the money. Then I suppose it is only fair to rub it in the noses of the inferior.